Special Containment Procedures: SCP-1011 is to be kept in Hall-07 at Site-35. Two guards are to be present at all times at the entrance to Hall-07 to prevent the removal of SCP-1011. The D-class population working on Site-35 as a part of currently running experiments is suspended from monthly termination schedule due to the extended length of time needed to study the effects of SCP-1011. As material produced during the experiment appears to lack anomalous properties, its use is approved for non-critical applications as defined in document CSG-0371-N. 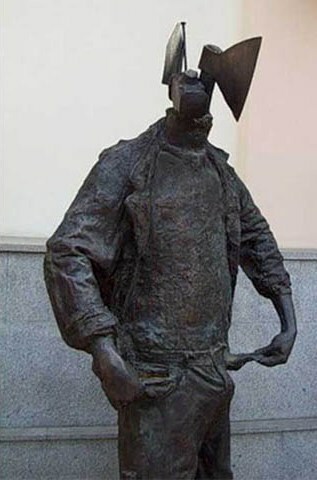 Description: SCP-1011 is a statue approximately 2 m tall, weighing approximately 4200 kg, depicting a worker whose head has been replaced by an assortment of tools. The pedestal bears an inscription stating "Man is the most important means of production," and the year of casting is stated to be 1927. Material analysis has revealed the composition to be ordinary cast iron with 2.3 wt% carbon content. SCP-1011's anomalous properties manifest when it is seen by human subjects who will engage in productive labor no later than three hours after the sighting, and escalate slowly with additional exposure. Denial of exposure to SCP-1011 has been shown sufficient to halt the progress of the condition. During stage I, subjects, designated SCP-1011-1, will begin to demonstrate a heightened sense of morale and satisfaction, voluntarily working longer hours and paying increased attention to their task. As the phase progresses, SCP-1011-1 cease activities other than work, sleep, and satisfying basic bodily needs. After approximately ██ months, stage II is marked by the SCP-1011-1 initially beginning to show reluctance to use means of personal safety, such as helmets, gloves or safety glasses. When questioned, SCP-1011-1 respond finding them "unnecessary" and "binding". As the phase progresses, SCP-1011-1 also slowly cease to utilize tools, favoring the use of their own body even at risk of minor damage. This phase lasts for approximately ██ further months. The onset of stage III is marked by insomnia in SCP-1011-1. Instead they congregate within eyesight of SCP-1011, and cease movement, staring at it for 3 hours a day average. The effects of stage II progress with an almost complete abandonment of tool and machine use by SCP-1011-1, with them often acting in groups to replace lost functionality. Bodily deformations appear on SCP-1011-1 at this stage, which tend to facilitate their tasks. SCP-1011-1 at this stage have a marked resistance to pain. This stage lasts indefinitely. On at least one known occasion, the condition caused by SCP-1011 progresses into stage IV - terminal stage. During this stage, SCP-1011-1 use one another as construction material, depleting the population of an afflicted factory in a matter of days. Despite extensive experimentation with possible triggers, attempts to initiate terminal stage among the D-class population of Site-35 have been unsuccessful. Recovery Log: SCP-1011 came into attention of the Foundation at ████████ Steelworks of 28th October, Bashkir ASSR, RSFSR, Soviet Union (currently Site-35) on ██/██/1947, after an inspection was mandated as a part of price-awarding procedure due to the consistent exceeding of production targets1 (see Addendum 1011-1). However, before containment by the Foundation could be attempted, the entire site was taken off limits by agents of Division "P" (Psychotronics), GRU - at around this time stage IV had apparently occurred (see Addendum 1011-2 for a leaked report section). Following the dissolution of USSR in 1991, Foundation agents persuaded the government of Russian Federation to decommission and sell the site to a Foundation front-end for [REDACTED] dollars, and Site-35 was established around it. The directing committee of [REDACTED] welcomed me cordially, however I couldn't help but notice a marked lack of focus and erratic behaviour on their part. Comrade M████████ kept talking about what a marvelous effect the statue that has been installed in the hall during the last 5-year plan has had on worker morale, and what a work of socialist art it is, and urged me to see it as soon as possible. On the other hand, comrade T███████ constantly filled in assorted forms, with what appeared to be just his finger, though I might be mistaken. The conditions in the main foundry are unfitting for the basic dignity of socialist man. Men barehandedly handle red-hot ingots, their hands black and shriveled, others pound rivets into sheet metal with their heads; I have seen two men use the back of third to saw through a log, his back covered in sharp ridges not found on a healthy person. They seem to feel no discomfort, and smile eagerly at every visitor. About a [DATA EXPUNGED] wire acted as a human lifting mechanism of sorts - when five of them fell into the molten metal, another replaced them within moments. Comrade M████████ , who was my guide on the tour didn't appear to find any wrongs with the present arrangement, answering a few of my questions reluctantly, then continuing to extol the virtues of the statue. I request immediate shutdown of operations at ████████ Steelworks of 28th October, its quarantining and further investigation. Despite the exceptional effort needed towards the rebuilding of our Motherland, this is decisively not the path we are to take. Furthermore, the observed could be signs of sabotage as per the recent circulatory detailing min[DATA EXPUNGED]. Upon arrival, the site appeared to be deserted. The offices were empty, no sight of either the directors or the party committee. The hall containing the object contained several piles of clothing and some [DATA EXPUNGED] but otherwise nothing notable. Lieutenant N████ appeared overly disturbed and obsessed by it, but I managed to force him to follow on. In the main foundry we found 94 of produced ingots, the last 15 of which having a distinct texture. Scraping one with my knife revealed considerable softness of the material and I was able to dislodge bone-like segments. The furnace was cooled, inspection revealed it containing remains of blood and scraps of tissue, however [DATA EXPUNGED]stency. Large segments of the rolling and extrusion assembly were replaced by severely [DATA EXPUNGED] apparently expired. encountered one of the former workers, He lacked clothing and his ana[DATA EXPUNGED]. Ignored questioning and kept repeating "Job's done." He was detained for further questioning. 1. Sources indicate SCP-1011 has been installed in ████████ Steelworks of 28th October during late 1944, being found in the inventory of [REDACTED] during its bombing by the Wehrmacht on ██/██/1944. No previous records seem to exist of its inventarisation, delivery, or ordering.